DEM: What happened to Jimmy Hoffa? Where was he killed? Who killed him? Where was his body disposed? arrange and execute the murder of President Kennedy? The Hoffa Wars, published by Paddington Press in August 1978, chronicled the rise and fall of former Teamsters general president Jimmy Hoffa. In this book, according to the Associated Press, Moldea was the first to present the case that Hoffa and two Mafia figures--Carlos Marcello of Louisiana and Santo Trafficante of Florida--were involved in the assassination of President John F. Kennedy. A year after Moldea's work was published, the U.S. House Select Committee on Assassinations came to the same conclusion in its final report. In January 1992, Frank Ragano, the attorney who represented Hoffa, Marcello, and Trafficante, confessed that he was a principal in the Hoffa-Marcello-Trafficante murder plot against the president. Newsweek also credited the first reporting on this matter to Moldea, "who made the Teamsters-JFK-Ragano link in his 1978 book, The Hoffa Wars." Moldea also revealed new details about the CIA-Mafia plots to murder Cuban premier Fidel Castro, as well as excerpts from his exclusive interviews with the men identified by the FBI as Hoffa's killers, including Salvatore Briguglio, the alleged triggerman. Further, the book explained the turbulent history of the rank and file reform movement within the Teamsters Union. A blatant attempt to suppress Moldea's book--detailed in a June 29, 1978, New York Times article--was unsuccessful. Times literary writer Herbert Mitgang wrote, "Publishing lawyers said that the attempted delay of the Moldea book was one of the first examples of [a] possible loss of independence--with implicit censorship--where there is a conflict on a controversial nonfiction book." 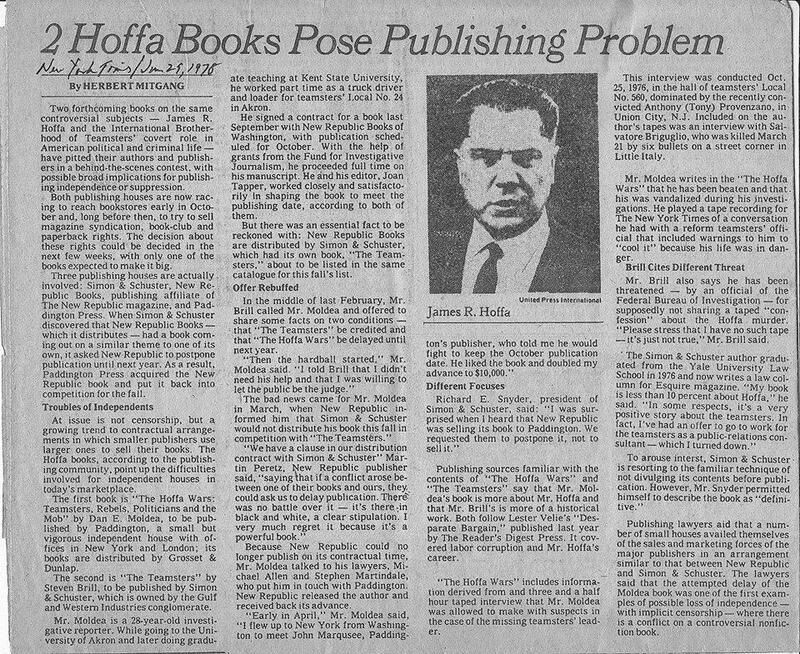 Despite the controversy, The Hoffa Wars was selected by the Book-of-the-Month Club and syndicated by the New York Times. The book was published in mass market paperback by Grosset and Dunlap in September 1979 after three hardcover printings. It has also been translated into French, Italian, and Japanese. Retitled, The Hoffa Wars: The Rise and Fall of Jimmy Hoffa, the book was re-released in January 1993. Commenting on The Hoffa Wars, the Chicago Tribune described it as being "as extensively researched a volume as one is likely to come across in the field." 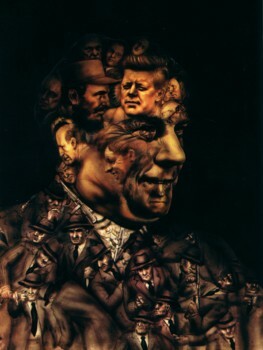 The Wall Street Journal wrote, "Mr. Moldea's view of [the Hoffa] wars, which reached its greatest intensity when Robert Kennedy was Attorney General, may explain not only Mr. Hoffa's disappearance but the assassination of John Kennedy as well." The Washington Post stated, "If Moldea were a prizefighter, he would be a kind of Rocky Graziano. He never, never quits punching. Moldea never relents." New York magazine wrote that it was "passionate, detailed, and coherent. . . .The superiority of the Moldea book lies in the inherent drama of the unfolding history." The Christian Science Monitor called it, "well-documented, detailed, and terrifying." The Village Voice said that the book was "a fascinating inside history of the union, its triumphs and corruption." The Houston Post stated that The Hoffa Wars was "definitive and will likely serve as the touchstone for all future speculation and books exploring Hoffa's fate." 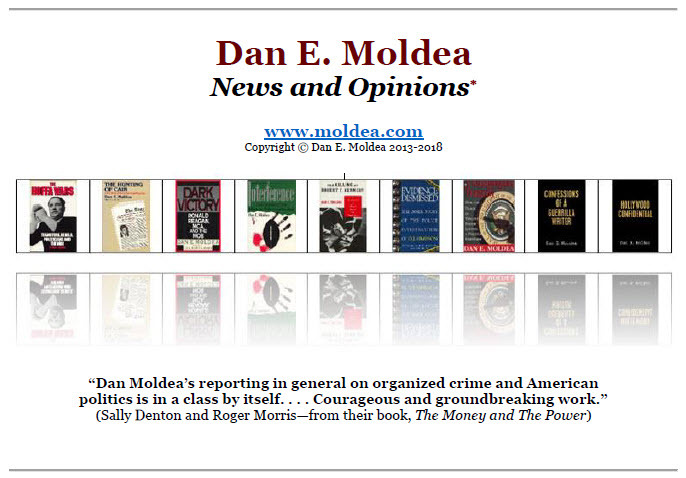 Convoy, the voice of the Teamsters' rank and file reform movement, added, "Moldea provides a very valuable contribution. He helps explain the rank and file tradition for today's reform movements. He understands that tradition, because he's no outsider to it." DEM: "My afternoon with Jimmy Hoffa's alleged killer"
DEM: The Lineup (Open Road Media, July 28, 2015): "What Really Happened to Jimmy Hoffa"
DEM in the Washington Post about the movie, Hoffa: "Tales of Hoffa: Why Does Hollywood Make Thugs Into Heroes"
DEM: The Lineup (Open Road Media): "What really happened to Jimmy Hoffa?" Chapter 28: "Who is Frank Sheeran?" Chapter 32: "I think my dad knew Jack Ruby"
Chapter 149: "They're digging at a farm in Wixom"
Chapter 150: "It's going to be a great day tomorrow"
September 17: Was Jimmy Hoffa's body moved from Jersey City to Paterson? July 20: DEM memorandum: "Who is Vinnie Ravo?" I have often said that the New York Times created me as an author. This is the article—written by Herbert Mitgang, then the NYT’s chief book critic, and published on June 29, 1978—that made it so. 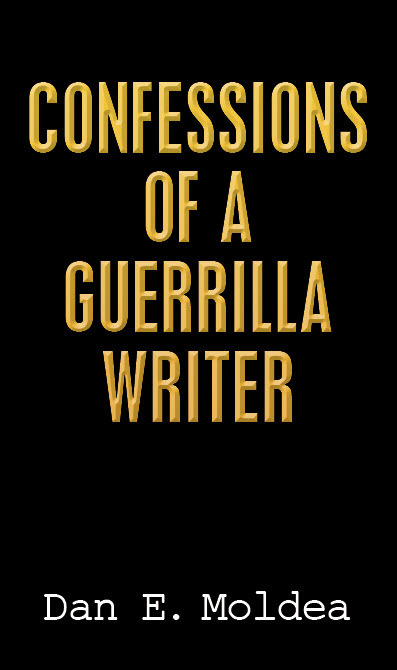 It details my battles with Steven Brill, who was publishing a rival book about the Teamsters, and his publisher, Simon & Schuster, which blatantly attempted to suppress my book from publication. 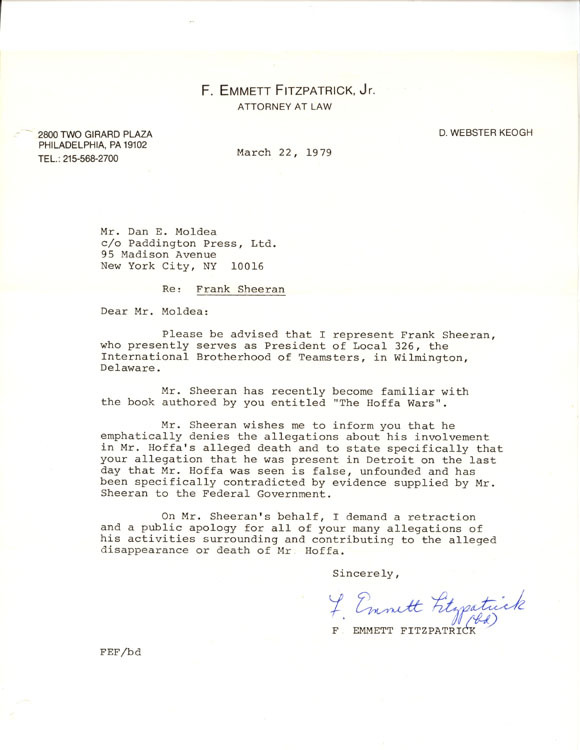 After I alleged that Frank Sheeran was involved in the murder conspiracy against Jimmy Hoffa in my 1978 book about Hoffa, I received this letter from Sheeran's attorney, threatening me with litigation. . . . From 2001 to 2003, Sheeran made a series of confessions--although there was a problem distinguishing the truth from his conflicting versions of events.